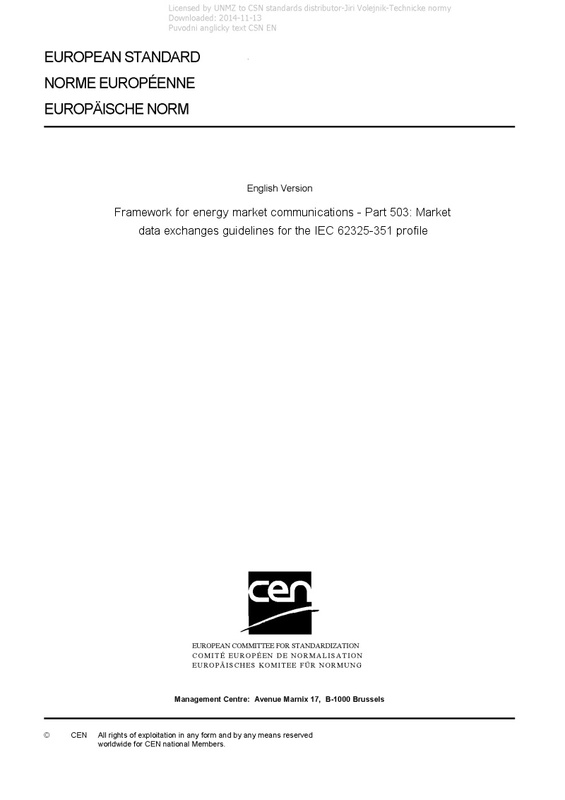 EN IEC 62325-503 Framework for energy market communications - Part 503: Market data exchanges guidelines for the IEC 62325-351 profile - IEC 62325-503:2018 specifies a standard for a communication platform which every Transmission System Operator (TSO) in Europe can use to exchange reliably and securely documents for the energy market. Consequently a European market participant (TSO, regional supervision centre, distribution utility, power exchange, etc.) could benefit from a single, common, harmonised and secure platform for message exchange with other participants; thus, reducing the cost of building different information technology (IT) platforms to interface with all the parties involved. This edition cancels and replaces IEC TS 62325-503 published in 2014. This edition includes the following significant technical changes with respect to the previous edition: a) Use of ISO/IEC 19464:2014, Advanced Message Queuing Protocol (AMQP) v1.0 specification; b) Splitting of the node described in the IEC TS 62325-503:2014 into a broker that implements the messaging function and a directory; c) Increase of operability and resilience of the communication system with the ability for an endpoint to send and receive messages through several brokers; d) Benefits of standardisation, performance and scalability of the AMQP protocol for transferring messages.